we are having trouble trying to understand a insertion called by HaplotypeCaller (HC). First we can't see any read confirming the insertion in IGV. Second is that HC is telling us that it has a coverage of 126 reads and only 12 confirming the insertion but it calls as a homozygous insertion. Could you help us to find a direction to understand what is happening please? 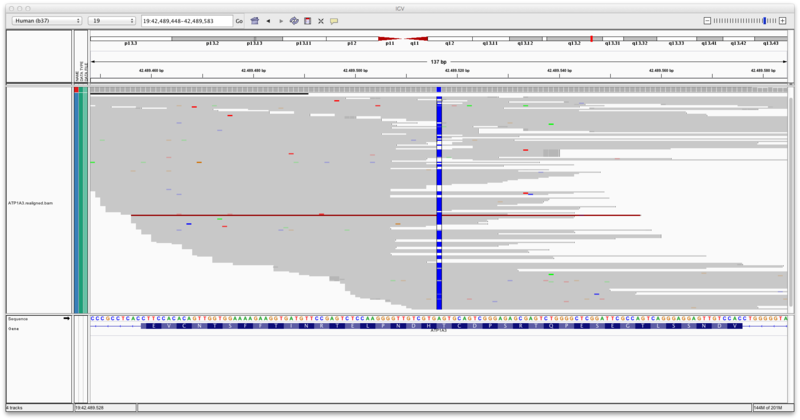 Please note that the insertion seq is on the reference genome (b37) and it ends at the start position called by HC. Try running on that region again with the activeRegionOut argument to output the snippet of the bam after it's been reassembled by HC. Perhaps that will shed some light on what the HC thinks it's seeing. I'm running it, as soon as i have the answer i'll let you know. @Geraldine_VdAuwera, it was exactly what we needed. Thank you.